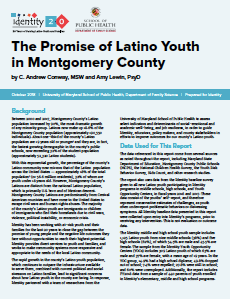 Identity Releases New Report on Promise of Latino Youth in Montgomery County – Identity, Inc.
A new report by researchers at the University of Maryland School of Public Health found that Latino youth in Montgomery County express high academic motivation, high academic expectations, and a positive outlook for the future, but that they become markedly less optimistic as they get older because of significant barriers to success in their studies, work, and life. Montgomery County’s Latino population increased by 90% between 2000 and 2017 and Latinos now make up 18.6% of the county. Latinos are the fastest growing demographic in the county’s public schools, exceeding 32% of the student population (more than 52,000 students). This rapid growth, combined with current political and social stressors on Latino families, led to significant concerns about how Latino youth in the county are faring. 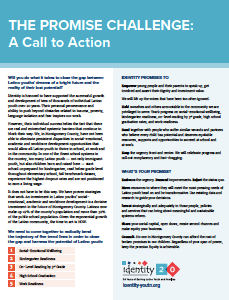 Identity partnered with a team of researchers from the University of Maryland to assess a variety of indicators in order to guide policymakers, leaders, and educators on how to improve outcomes for Montgomery County’s Latino youth. The report by Amy B. Lewin, PsyD and C. Andrew Conway, MSW of the University of Maryland School of Public Health, draws on data from a variety of sources including: the Maryland State Department of Education, Montgomery County Public Schools, The National Children Health Survey, the Youth Risk Behavior Survey, Kids Count and other research studies, as well as self-reported data from the students themselves – 1,125 Latino middle- and higher-schoolers and more than 300 youth who are neither in school nor employed. The percentage of youth surveyed who have positive expectations for their future significantly decreases with age: 87% of middle school students feel positively about their futures, compared to 76% of high school students. Graduation: At the national level, graduation rates rose to a new high, with 79% of Latino students graduating on time. In Montgomery County Public Schools (MCPS), graduation rates for Latino students are on the decline, from 80.03% in 2014 to 78.54% in 2017. Dropout: While the Latino high school dropout rate has been falling nationally to 10% in 2016, the dropout rates for MCPS Latino students is on the rise, from 11.1% in 2014 to 13.76% in 2017. While unemployment for Latinos in Montgomery County is down, approximately six in 10 Latinos work in low-wage occupations that do not offer health insurance. Latinos have the lowest median household income in the county and 15% of Latino children live at the poverty level.